I often wonder why people are so attracted to Pope Francis. What is it about the Pope that makes us want to listen to another documentary of his life? Why are we infatuated with the Pope? I believe it is because we are seeing an authentic leader who is above all human, vulnerable, paradoxical, kind, and caring. He is the real thing and people are recognizing it. 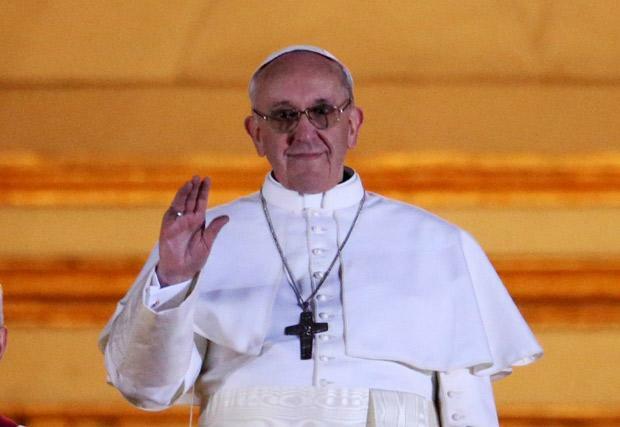 The Pope is a leader who brings forth a message of joy, mercy and tenderness. I often wonder if this is what people experienced when the encountered the historical Jesus. The Pope mirrors the gospel back to us when we can’t get our head around it. We breathe a sigh of relief that we have a pragmatic pope who wants to wear comfortable shoes and drive less expensive cars. He has made it clear he is a Pope to and for the people. He has brought the words "ordinary" and "humility" front and center to the Church. Pope Francis is a man who truly has taken on the role of shepherding a flock – ironically his flock is the planet. He genuinely cares about connection and it doesn’t just stop with the Catholic Church. He is genuinely concerned about the family, systems of oppression, building bridges for dialogue and the planet's environment. I believe we are attracted to this Pope because he has the courage to think big, generously and be inclusive. He reminds us we are one and but does not shirk pointing out how divided we have become. He calls us back to connection and oneness, not in shame but in faith and hope. He has the capacity to hold the opposing view so sincerely and thoughtfully, and to top it with off with cheerfulness, so that he makes it hard for anyone to want to demonize our enemies or political opponents. And overall he remains vulnerable with a hospitable heart. As a matter of fact he is so hospitable that he is willing to come to richest nation on earth. Why? Maybe to remind us Americans that, believe it or not, we are not center of the universe but a nation blessed by God who values freedom, a humble spirit and a hospitable heart. Last week, seven sisters (including me) were involved in an event with sophomore women at the College of Saint Benedict. The women, Residence Assistants (RAs) from Lottie and Margretta halls of residence, invited me to ask a few sisters to come to tie blankets (that they are giving to Catholic Charities) and to tell stories. It was so much fun! As we entered the building (Margretta Lounge), the smell of cookies filled the air making us all excited about the possibilities of eating some. Yes, the RAs who were sponsoring this event had baked chocolate cookies and served them with milk! They had laid out five different fleece blankets on the floor for us to tie. We all got started and young women started streaming in, both from Margretta and Lottie. They just kept coming and coming, with as many as six or seven helping with each blanket. That did not take long because of the many hands at work!